I’ve never been a huge fan of zucchini, probably because I’ve only had it cooked a few ways that I enjoy it. My friend, Kelly, served us a zucchini medley a few years back that was delicious and easy but I’ve yet to duplicate it at home. Then I saw Ina Garten, aka The Barefoot Contessa, make these zucchini pancakes and I had to try them. 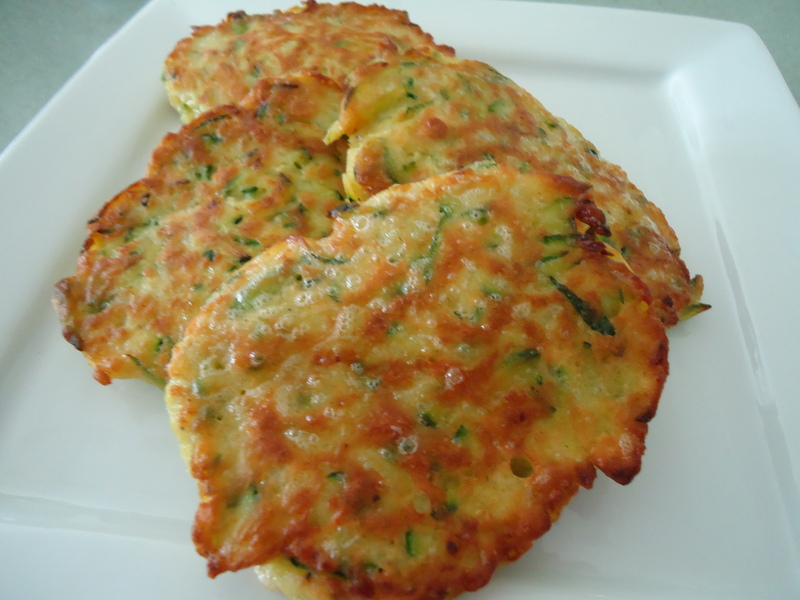 If you read my post on the spatchcocked chicken and vegetables, as promised, here is the recipe for zucchini pancakes. The are really surprisingly delicious and easy to make. They cook up quickly and, although you can keep them warm in the oven, I suggest preparing the mixture and cooking them at the last-minute. If you’re serving them with an entree that needs to rest, it’s the perfect time to make these. They take about 5 minutes to cook. Recipe note: Don’t use olive oil here. Use a neutral oil like canola or vegetable oil. Heat a large (10 – 12 inch) saute pan over medium heat and melt 1/2 tablespoon butter and 1/2 tablespoon oil together in the pan. When the butter is hot but not smoking, lower heat to medium-low and drop heaping soup spoons of batter into the pan. Swirl the back of the spoon around the batter to even out the pancake. Cook the pancakes about 2 minutes on each side, until golden brown. This entry was posted in Side Dishes and tagged Vegetable. Bookmark the permalink. 1 Response to The Barefoot Contessa’s Zucchini Pancakes – Oh So Good! I happened upon this, surfing through television shows one day, and boy! Am I glad I saw the Barefoot Contessa taste testing one! I knew I had to try them, and I did! Posted pictures at my Facebook page and on my recipe tab on my blog! Awesome goodness! Thank you!